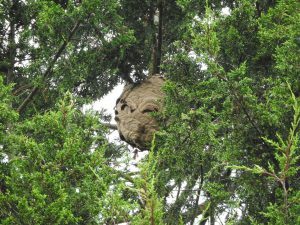 The Asian hornet nest in Tetbury has been found and destroyed. The nest was found at the top of a 55 foot tall conifer tree. Inspectors from the National Bee Unit are continuing to monitor the area for Asian hornets alongside local beekeepers. However to date, no live hornets have been seen since the nest was removed.